You know how powerful one’s imagination can be. Well, sometimes it might spur us on to do great things, but at other times, it is nothing but a pipe dream – an impossible achievement, only to remain within the confines of our minds. If you felt that you have had a calling to be a DJ, then you might want to consider giving this cute little £12.95 Finger Deck a go. What does it do? Well, you are able to mix and scratch your very own music collection in the form of such adorable mini electronic mixing decks, letting you be a superstar DJ within your cubicle. Flip the cross fader to play the decks’ inbuilt backing tracks, while spinning the turntables and hitting the beat buttons will result in you scratching out a top tune. 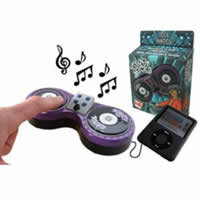 You can even hook up your MP3 player and enjoy your favorite dance tracks via the Finger Decks’ built-in speaker.